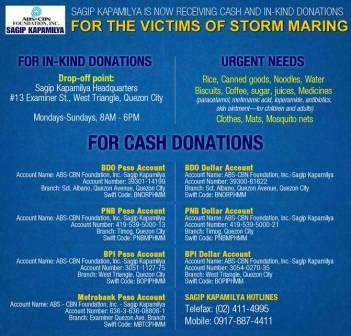 ABS-CBN Foundation, through its disaster emergency and rehabilitation arm ‘Sagip Kapamilya,' has already started its massive relief operations for the flood victims of typhoon Maring and Habagat in National Capital Region (NCR) and nearby provinces in Luzon. Relief goods were recently provided to hundreds of families in Cavite, Ilocus Sur and Quezon City. In its continuing efforts, Sagip Kapamilya has also opened its helpdesk hotlines--024114995 023949272, and 09178844411--for people who need rescue and relief as well as for interested parties who want to donate. In-kind donations like rice, canned goods, noodles, biscuits, coffee, sugar, water, clothes, blankets, mats, and medicines are now being accepted at #13 Examiner St., West Triangle, Quezon City. For cash donation, interested parties may deposit it to Banco de Oro (BDO) under the account name ‘ABS-CBN Foundation Inc.-Sagip Kapamilya’ with account number 393-011-4199. For international cash donations, Sagip Kapamilya’s BDO dollar account number is 393-008-1622 with a ‘swift code,’ BNORPHMM.